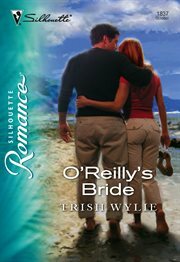 The item O'Reilly's bride, Trish Wylie, (ebook) represents a specific, individual, material embodiment of a distinct intellectual or artistic creation found in Charlotte Mecklenburg Library. Trish Wylie's novels sparkle with lyrical Irish warmth! Sean O'Reilly had become so close to his colleague and friend Maggie Sullivan that he was beginning to imagine their friendship could lead to more. Only now, bizarrely, she's backed off - and, even more strangely, she's started looking for love on the Internet! Well, if he can't beat them, he'll have to join them...Maggie can't let herself get close to Sean. Not now. Not when she's discovered something that will break all his dreams of happy-ever-after. But she has no idea how much she has hurt Sean - nor how much she has just fueled his determination to make her his - by any means necessary!